Michael McFadyen's Scuba Diving - The Colours The coastline of the Eastern Suburbs of Sydney has some fantastic dive sites. 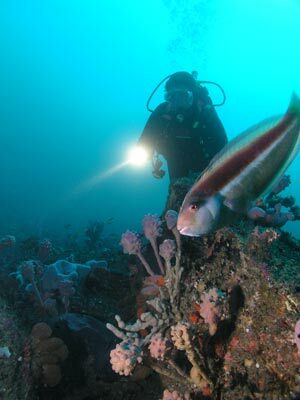 The whole section of coast from the South Head of Sydney Harbour to Cape Banks, the northern headland of Botany Bay, has literally hundreds of places you can dive. While the sites that can be dived from shore are somewhat limited, the sites that can be dived from a boat are almost limitless. Diving out of Sydney Harbour is also fantastic. There are dozens of sites north and south of the harbour that are easily accessible to boat owners. The majority of them are fairly close to the Harbour and within a short run from the boat ramps. One of these sites is The Colours. This is located just south of South Head. Once you leave Sydney Harbour, turn right and head out at about 45°. 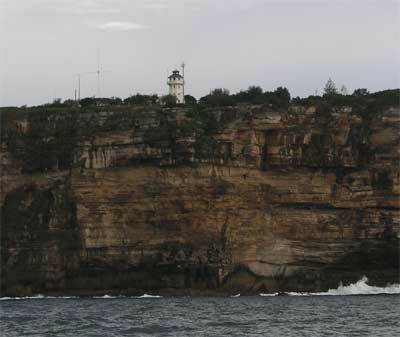 When you are off the Macquarie Lighthouse (this is the older of the two lighthouses and the first one south of The Gap), you are near the dive site. Head straight out from the lighthouse. Line up the pole containing the radar on the north of the lighthouse with the side of the lighthouse. 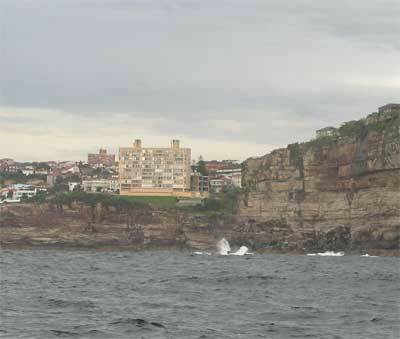 To the south-west, line right side of the large block of units at Dover Heights with the left side of the smaller block. The GPS mark for the anchoring spot is 33° 50.9947' S 151° 17.6482' E (note that this GPS Readings is in WGS84 which is the normal one used by GPSs - if you use any other datum, you will need to convert the reading - see my GPS Page for more details). 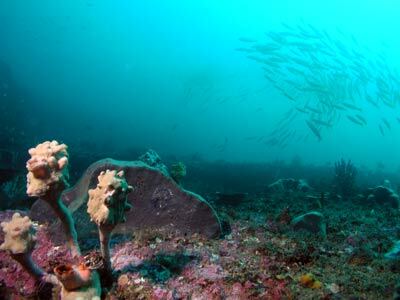 This dive site is quite large and consists of a section of the reef where there is a relatively rapid drop from the reef top to the sand bottom. The reef top is about 22 metres and the sand about 30 metres. Depending on where you actually cross the reef edge, the reef drops from 22 metres straight to almost 30 metres or drops in one or two walls to 26 metres and then the bottom at just over 30 metres. In any case, drop anchor somewhere on the top or on one of the intermediate ledges. The reef here runs from the northern end in a south-eastern direction before running south and then back to the south-west and then west. I am not sure where the reef goes at the northern and southern ends. It is said to be about 150 metres long. As I mentioned before, this dive site consists of a reef top that drops in one or two dramatic walls to the sandy bottom. The sand actually is only small here and there is a bit more reef out further before the sand proper is found. It is a spectacular site, with lots of colour (hence its name) from the sponges, sea squirts and other fixed marine life that cover almost every square inch of the site. There are also some nice gorgonias. At the northern end, the reef drops from 22 metres to about 28 metres and then gradually over some small boulders to over 30 metres. 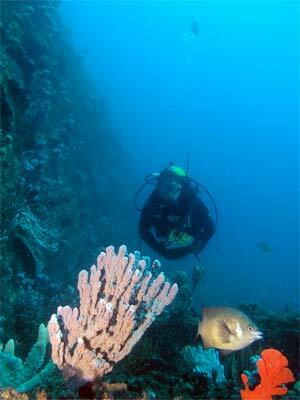 At 28 metres there are a number of large holes in the reef bottom, circular and about a metre deep. Out further the reef drops to about 33 or even 35 metres. At the southern end of this wall the wall becomes less distinct and goes from 22 metres to over 30 metres over a longer distance and with a number of smaller drops. Here the reef goes a little to the east and there are some larger boulders on the edge that create some small gullies. It quickly turns back towards the south-west and the wall becomes more prominent, dropping from 22 metres to about 26 metres. There are still some smaller boulders on the edge. Again, after a short distance the wall becomes less prominent and only a metre or so off the bottom (the top of the reef has dropped here from 22 to 25 metres). 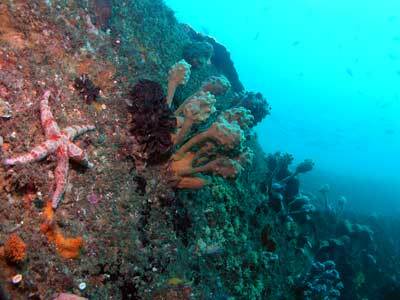 As mentioned, the colour comes from the sponges, sea squirts, ascidians, gorgonias and other fixed marine life. The fishlife on my dives here have ranged from not overly prolific to mind-blowing. In the the one that had little fish, there were lots of seapike, silver sweep, some small bream, a few black reef leatherjackets and a couple of large mosaic leatherjackets. As well, there were some yellowtail, mado and a few one-spot pullers. On the mind-blowing dive, there were thousands of silver sweep and one-spot pullers all over the reef, darkening the bottom when they went over head. This dive also had large schools of large seapike. A very colourful site, with spectacular scenery. Due to the depth, you can only spend about 17 to 20 (or 22 minutes if you spend more time on the top of the reef) at this site before running into decompression. Due to the depth, I would only recommend that relatively experienced divers should visit this site.